Of all pursuits, love is the most profound, be it sensuous or sublime. This legendary love story of ill-fated couple, an epitome of pure love, ‘Heer-Ranjha’ was written by Sufi poet Waris Shah. Little did he know that about 200 years later, his seminal work’s intimate aspects would receive its rightful interpretation in the form of a surreptitious musical dialogue, arranged by three of the greatest legends, one, an exceptional composer and the other two, genius singers of their era. 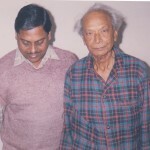 I had an interview of Naushad Sahib, the Great Music Composer of the Bollywood. I wanted to publish it in my book about all time Great our Mohd. 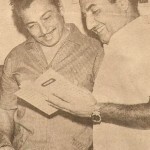 Rafi Sahib. But my dream couldn’t be a reality only due to some unavoidable circumstances in my family. But, now I want to share my feelings about our Rafi Sahib & Naushad Sahib after 10½ years, as I am still not able to publish such a book. I hope, the fans of Rafi Sahib and the readers of Mohd Rafi.com ’ll surely forgive me for the delay in presenting the precious information. Lots of such type of ill baked comments here and there compelled me to write this article. You are currently browsing the Rafians tribute to a true Maestro – Mohd Rafi weblog archives for June, 2011 .